ULTRA BRIGHT HALOGEN REPLACEMENT: Illuminate with a blinding 2,400 lumens of light makes an ideal replacement for fragile and short-lived halogen bulbs. 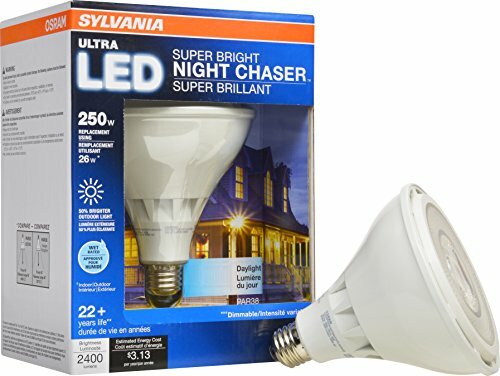 Ultra is Sylvania's premium replacement bulb. NEVER REPLACE BULBS: Bulbs last a 25,000 hours (That's 22 years, if used 3 hours per day!) so forget about climbing ladders to replace hard to reach lighting. DAYLIGHT COLOR TEMPERATURE: 5000 Kelvin is closer to natural daylight which makes it a great choice for task lighting and general illumination. Perfect for use indoors on high ceilings in living space track light or downlight applications. It is also UL wet rated for use outdoors for house and yard. PROTECT YOUR HOME: Illuminate your house and yard and protect your family from critters and neighborhood pests - pair with safety, motion activated security lighting. Bulb instantly turns on providing you with reliable visibility when you need it most. SAFE FOR HOME: UV and IR free, never made with mercury or lead.